ThunderMax Auto Tune 309-362 for 2008-2013 Harley Touring Motorcycles with FREE PREMAP and DYNO COUPON! HomeTop PicksAutomotiveThunderMax Auto Tune 309-362 for 2008-2013 Harley Touring Motorcycles with FREE PREMAP and DYNO COUPON! ThunderMax Auto Tune Module 309-362 fits 2008-2013 Harley FLH/FLT Touring Models with Throttle by Wire. ThunderMax® Auto Tune is the industry’s first and only stand-alone performance EFI management system developed specifically to meet the tuning needs of FLH/FLT Touring Throttle-By-Wire H-D® motorcycles. This highly advanced tuning system is a completely new Electronic Control Module that replaces the factory unit and allows the user to install a wide range of performance enhancements that add-on signal modifier devices cannot properly execute. The ThunderMax with AutoTune is made in the USA and backed by a 3-year warranty. This product replaces the stock ECM and requires 18mm bung holes in the exhaust head pipe. Email Cycle Solutions Inc. with your bike modifications such as exhaust, air intake, cams, etc and we will set up your thundermax auto tune with the proper starting map for your bike! Also comes with a FREE DYNO Diagnostic Coupon to use at an event of your choice. Tag: ThunderMax Auto Tune 309-362 for 2008-2013 Harley Touring Motorcycles with FREE PREMAP and DYNO COUPON! Purchase ThunderMax Auto Tune 309-362 for 2008-2013 Harley Touring Motorcycles with FREE PREMAP and DYNO COUPON! at Discounted Prices ✓ FREE DELIVERY possible on eligible purchases. ThunderMax® with AutoTune is the industry's first and only stand-alone Performance EFI Engine Management System developed specifically to meet the tuning needs of Throttle-By-Wire H-D® motorcycle owners. This highly advanced tuning system allows the user to support a wide range of performance upgrades with ease. 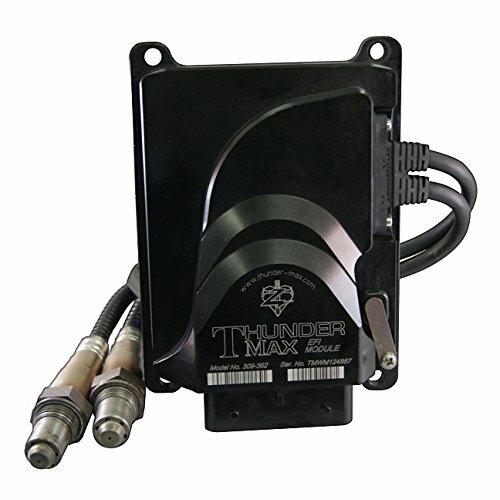 The all new ThunderMax® AutoTune TBW module includes all of the great performance enhancements that made the brand famous - with benefits you'll notice immediately, including quicker throttle response, increased power and cooler operating temperatures. The ThunderMax with AutoTune is a Wide-Band, Closed-Loop system which means it continually and automatically adjusts your air-fuel ratios every time you ride, regardless of changes in ambient conditions. All you have to do is ride and enjoy! The ThunderMax System can never be out grown... Change pipes, add cams, whatever! Just download a new map. ThunderMax software, firmware and map updates are accessible 24/7 with an internet connection. Email Cycle Solutions Inc and we will set up your Thundermax Auto Tune with the proper starting map based on your bike modifications plus you will receive a coupon for a FREE DYNO Diagnostic run at an event of your choice! ThunderMax Auto Tune Module 309-362 fits 2008-2013 Harley FLH/FLT Touring Models with Throttle by Wire. ThunderMax® Auto Tune is the industry's first and only stand-alone performance EFI management system developed specifically to meet the tuning needs of FLH/FLT Touring Throttle-By-Wire H-D® motorcycles. This highly advanced tuning system is a completely new Electronic Control Module that replaces the factory unit and allows the user to install a wide range of performance enhancements that add-on signal modifier devices cannot properly execute. The ThunderMax with AutoTune is made in the USA and backed by a 3-year warranty. This product replaces the stock ECM and requires 18mm bung holes in the exhaust head pipe. Email Cycle Solutions Inc. with your bike modifications such as exhaust, air intake, cams, etc and we will set up your thundermax auto tune with the proper starting map for your bike! Also comes with a FREE DYNO Diagnostic Coupon to use at an event of your choice.